Belle is a one in a million mare. She does EVERYTHING from jumping to running speed events. My daughter planned to show her last year so we pulled her out of “retirement”. We thought it would be a good idea to put her on a supportive supplement due to her age. After researching I decided to try SmartFlex Senior. We used it with wonderful results. Belle was used for 4H, Speed Shows (barrels, poles etc), hunters, and trail riding. My daughter rode in 19 classes at the 4H fair and placed in 16! Due to SmartFlex Senior Belle showed no signs of her age, and my daughter had a wonderful season with her. Oh my! Georgiana and Belle had the best time. They were new to each other and showed as the pro that Belle truly is. 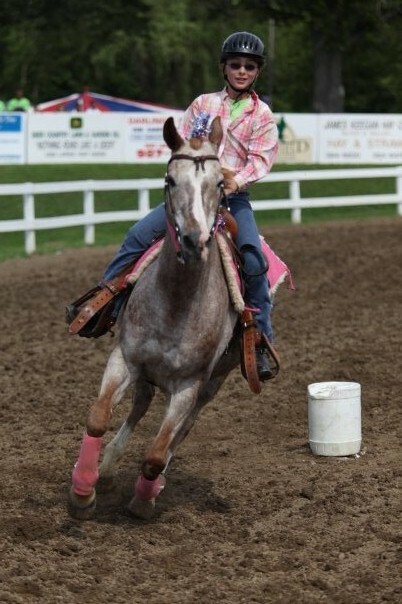 She’s an old mare but only by age, SCC 4H was great fun and this is what showmanship is all about! Bravo Belle and Kudos to Georgiana for loving Coutney’s mare! Great photo too! Love the smile!